Phfeast is a restaurant loyalty program where you can earn free meals for children and families in need, just by checking in when you’re dining at participating eateries. This start-up, based at the Venture Development Center at UMass Boston, provides a platform for loyal customers to earn meal rewards for families that rely on food pantries for assistance. “I have three young children of my own at home,” Napierski told me. “I feel fortunate to be able to put food on our table and to take them out for a meal. I started Phfeast when I realized that thousands of families in Massachusetts don’t know where their next meal is coming from,” he said. Napierski, a Framingham, Mass. resident whose background is in software development, has already created a web-based program for Phfeast and native Android and iOS apps are coming soon. Customers earn points each time they “check in” at participating locations. When each location reaches a specific number of points, it issues a dining certificate to a local food pantry, allowing an individual or family in need to dine at that restaurant for free. 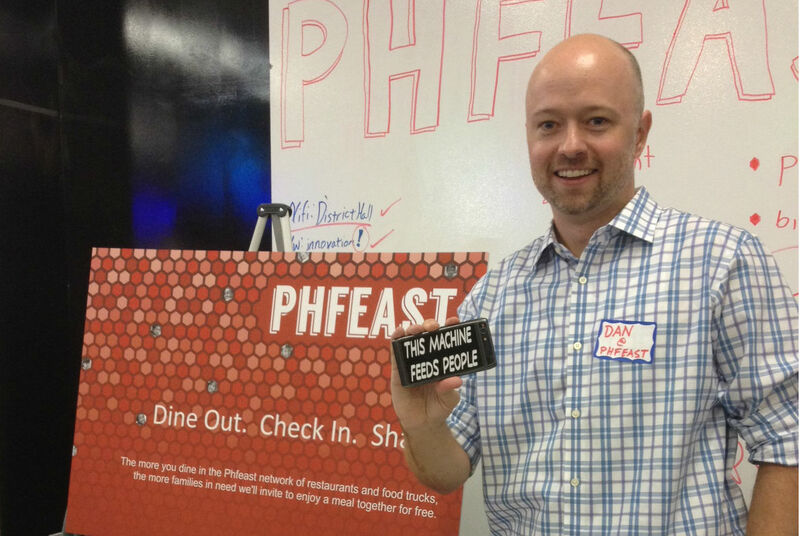 Phfeast charges the eateries a subscription fee. 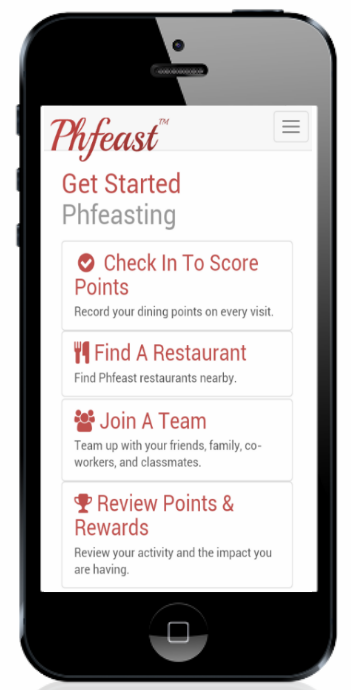 Participating restaurants get promoted by Phfeast and gain all the benefits of a traditional loyalty program. By promoting their participation in the program, the restaurants can attract new customers and encourage current customers to eat there more frequently. And the eateries will be able to account for and promote their charitable giving. Currently, there are 11 participating locations, including six Stone Hearth Pizza Co. restaurants, three Chicken & Rice Guys food trucks, the Amsterdam Falafelshop in Somerville, and the Foodie Café in Framingham. Napierski is adding locations rapidly and hopes to expand to other cities, starting with Washington, DC. Napierski is a strong supporter of the Food Day priorities. “In addition to helping to reduce hunger, we’re helping families eat safer, healthier meals at the participating eateries,” he said. “And many of the low-paid workers in the food industry rely on food stamps and food pantries to get by. It’s an honor to be able to give back to those workers by enabling them to enjoy a free meal, on the house,” he added. As we get closer to Food Day on October 24, signing up to participate in Phfeast as an eater, business or donor is an easy way for us to help reduce hunger, one meal at a time. For more info, visit http://www.Phfeast.com.